Just in time for Thanksgiving last week, the Centers for Medicare & Medicaid Services (CMS) released two final rules that could influence physician reimbursements in coming years. In terms of the actual 2014 Medicare physician fee schedule(www.cms.gov), CMS estimates that changes to the relative value units (RVUs) in the final rule will have no impact on family physicians’ Medicare allowed charges in 2014. In some sense, that’s the good news because, barring last-minute Congressional action, the Medicare conversion factor is scheduled to fall 20 percent next year. Anxiety over the Medicare Sustainable Growth Rate(www.cms.gov) issue has become an annual occurrence. But CMS also said it was developing "a series of initiatives" in the final rule that supports primary care and recognizes that care management should be increasingly rewarded because of its ability to improve patient health and limit the growth of future health costs. One of those initiatives, beginning in 2015, establishes a separate payment for chronic care management (CCM) services provided to patients with multiple chronic conditions. The payment would be made through a “G” code and cover at least 20 minutes of CCM services provided every 30 days. Patients will be required, at least every 12 months, to provide advance consent to the practice for the code to be used and can revoke consent at any time. Final details on practice standards for the code and payments rates are currently unknown and await future notice-and-comment rule making. The other final rule concerns the outpatient prospective payment system(www.cms.gov), which pays hospitals for their outpatient Medicare services. Specifically, CMS plans to replace the current five levels of hospital clinic visit codes for both new and established patients with a single code describing all outpatient clinic visits. 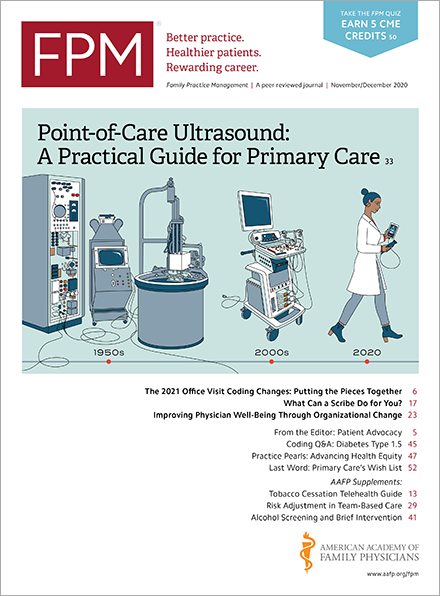 CMS believes a single code and payment for clinic visits is more administratively simple for hospitals and better reflects the cost of resources hospitals expend supporting an outpatient visit. The current five levels of outpatient visit codes are designed to distinguish differences in physician work. While this doesn't directly affect physician payments, physicians should keep an eye on it because it does not take a lot of creativity to imagine CMS doing something similar under the physician fee schedule somewhere down the road. It is something to think about as we wait to see if Congress rescues the physician fee schedule again this year.